Are you new to Harvest? 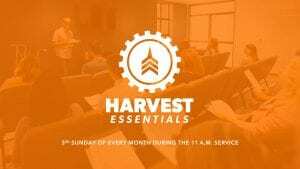 Attending Harvest Essentials is the next step for you to take and learn what we’re all about. This class is a pre-requisite for small groups, serving and membership. We meet in the Room 101 on the third Sunday of every month during the 11 a.m. service. Please email Steph to let the church office know you’re interested in attending.